I had a rough time last month. Personal illness and a rash of family emergencies had left my regular schedule in disarray. 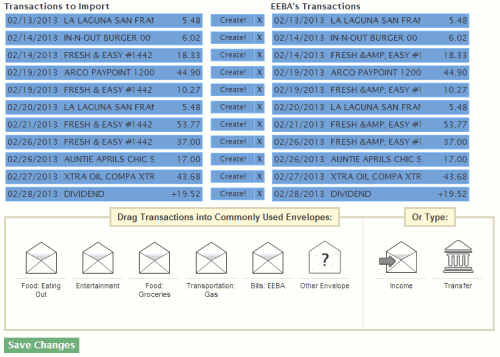 Among the organizational casualties in my life was my transaction history in EEBA. By the end of February I had gone three weeks without entering any of my expenses, leaving me with Envelopes that looked full but didn’t have much to do with reality. It’s a little daunting to see so much grey, but thankfully importing is pretty easy. 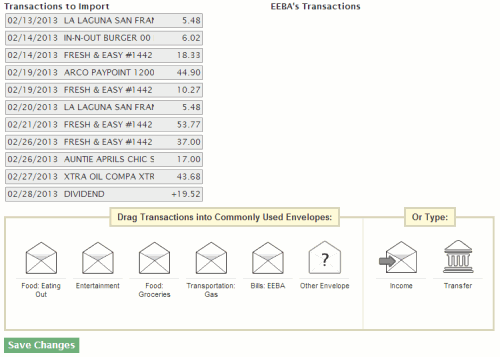 Just drag your transactions from the left onto an Envelope on the bottom of the screen to import them. We show you your most commonly used Envelopes, but if the one you want isn’t there just use the “other” Envelope. That will let you choose exactly which Envelope you want to assign the transaction to. That’s it. After a few minutes I had finished importing my transactions and my Envelope balances were all up to date and ready to take on the new month! It would be helpful if, like some of the other budgeting applications, you can set rules auto assign transactions to a particular envelope, e.g., I tend to bulk import periodically for certain accounts that have mostly automated activity (auto billpay, transfers, direct deposit, etc.). It’s tedious to have to repeatedly assign the same transaction (just different dates) to the same envelope. It’d be great if I could just set a rule that a transaction from a particular source or of a particular amount automatically gets assigned to a particular envelope. Thanks for considering! Hi E, I would create scheduled transactions that do what you want. Then when you import they’ll match automatically.